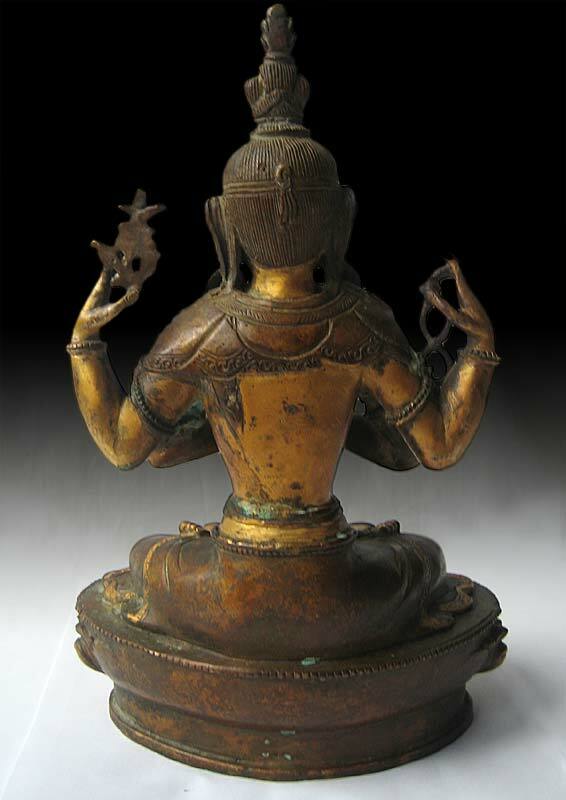 This is 19th century gilded Tibetan bronze is beautiful and unusual rendition of the four-armed Tibetan tantric Buddhist bodhisattva Avolokiteshvara-Chenrezig. 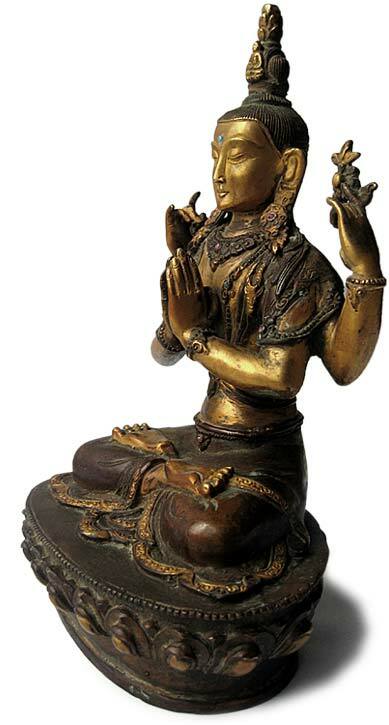 This is a deeply contemplative statue that renders the still, vibrant compassion inner state of realized boddhicitta into an elegantly articulated form. Chenrezig is considered the patron bodhisattva of Tibet. 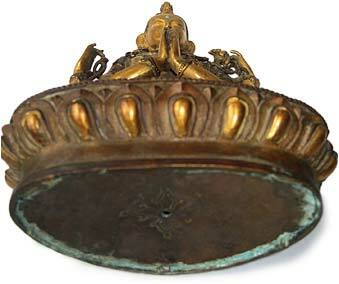 The Dalai Lamas and Karmapas are believed to be emanations of Avolokiteshvara. This Chenrezig is beautifully seated in the padmasana position; his sumptuously shaped feet with gracefully upturned, articulated soles are poised towards the sky. Side views reveal a level of detail that rendered this statue almost human, a wonderful tension to the depth of contemplation communicated here in gaze and posture. The hands hold the traditional accouterments associated with the deity. 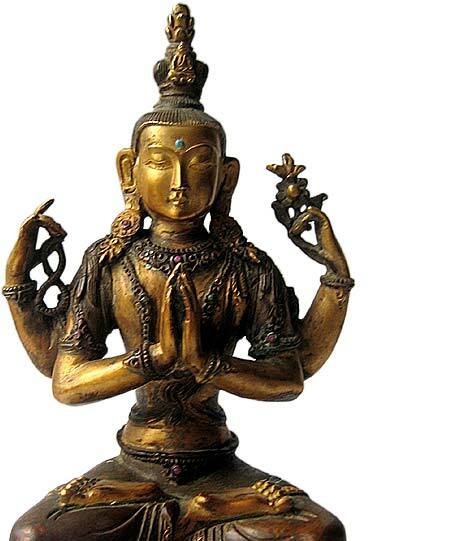 Gaze at his left hand and see a (padma) or a lotus. In the right hand is a beautiful Buddhist japamala or rosary. The front two hands are clasped in prayer. 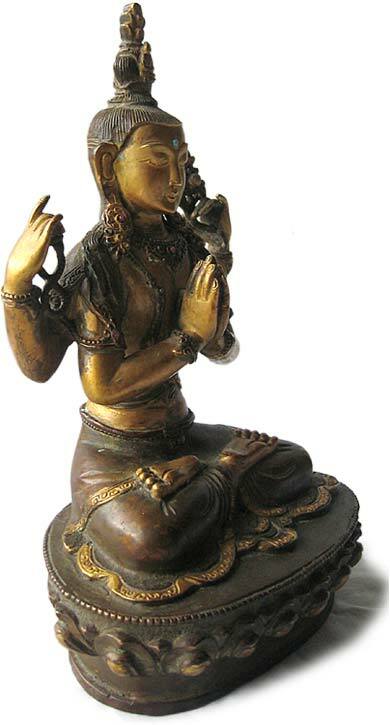 Chenrezig is often shown holding a luminous wish-fulfilling gem in these front hands. Instead, has the hands gracefully folded as if to indicate the eternal presence of the jewel. There are detailed precious stones (coral and turquoise) carefully placed at the third-eye and at key points of the statue, accenting the fine details on the deity’s finally draped vestments.